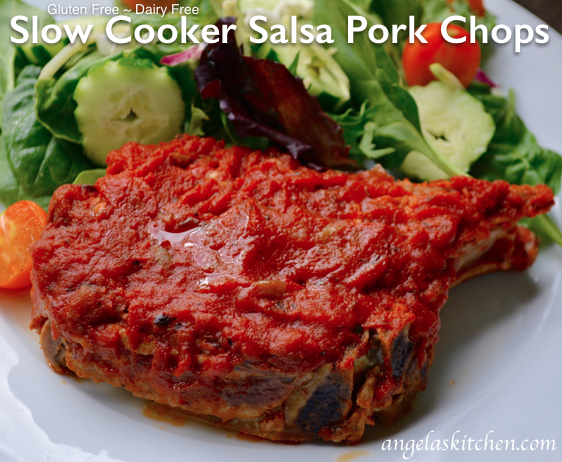 With it being Tex-Mex theme for this week’s Gluten Free Menu Swap, I just had to bring back this little blast from the past: Slow Cooker Salsa Pork Chops. I’ve added freezer instructions, freezer labels and a nifty recipe card for making more than one batch if chops go on sale. This is a great dish to come home to on busy school nights, but I also like it for summer-time meals. If the pork chops I am cooking are a little thin, or cook a little longer than usual (hey, it happens! ), I found you can shred the pork and use it for nachos, taco salad, taco filling, a topping for baked potatoes, sweet potatoes or gluten free noodles. It’s so versatile and pleases everyone in my family. I love that in a recipe! Use you favorite salsa with the level of heat your family enjoys. I use what ever we have on hand, but I particularly like using peach salsa when cooking this up in the summer. The sweet-savory combo makes a great sandwich filling when having a picnic dinner in the yard. Enjoy! Printable recipe card for Salsa Pork Chops for making multiple batches for the freezer. Warm oil in a skillet over medium-high heat, then add pork chops. Cook pork chops until browned on both sides. They do not need to be cooked though as they will cook more in the slow cooker. You are looking to give the meat a nice sear and color. In a bowl mix together the tomato sauce, salsa, lime juice, garlic, oregano, cumin, black pepper, and salt. Arrange a single layer of pork chops in slow cooker. Spoon a bit of sauce onto each chop. Add more pork chops to slow cooker, adding sauce on top of each one until all pork chops are in the slow cooker. Pour remaining sauce over chops. Cover slow cooker. Cook on low for 4 to 6 hours or on high for 2 to 3 hours until cooked through. Freezer instructions: Allow the pork chops to cool after searing. Place in a gallon sized freezer bag and add sauce. Mix sauce around pork chops, remove as much air as possible, seal, label and freeze. To serve: Thaw. Put contents of bag in slow cooker, cover and cook on low for 4 to 6 hours or on high for 2 to 3 hours. 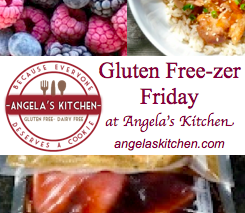 Welcome back for another menu plan from Angela’s Kitchen! I am so glad to have you stop by. Pull up a chair and let’s get started! 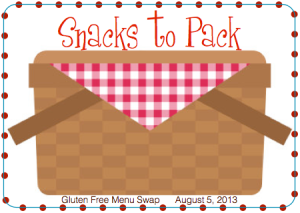 Heather is hosting the Gluten Free Menu Swap this week over at Celiac Family. The theme is Snacks to Pack. For traveling, camping, for school, picnics and simply busy evenings, I rely on portable foods quite often. Recently I posted some unrefrigerated snacks and lunches we take camping, but it also good for road trips and day trips. Muffins are always easy (and tasty) to pack, as is make your own Fruit on the bottom Dairy Free Yogurt. What are your favorite portable foods? 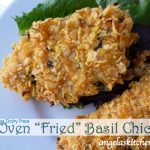 Freezer cooking plan for the week: Thai Chicken Burgers and Oven “Fried” Basil Chicken will both be making their way into my freezer this week. The week’s breakfast options: Apple Cider Muffins, Chocolate Zucchini Bread, scrambled eggs with garden veggies, and melon. The week’s lunch options: Sandwiches made with Gluten Free Wholesome Multi-Seed Bread, veggies and fruit. 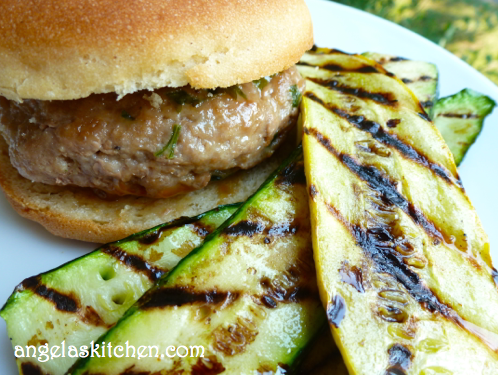 For the freezer: Make a double batch of Thai Chicken Burgers, one batch for dinner and one for the freezer. While eating dinner, place the patties from the second batch on a baking sheet lined with plastic wrap, then into the coldest part of the freezer. After dinner when burgers are frozen solid, place into a gallon sized freezer bag, removing as much air as possible, then seal, label and freeze. 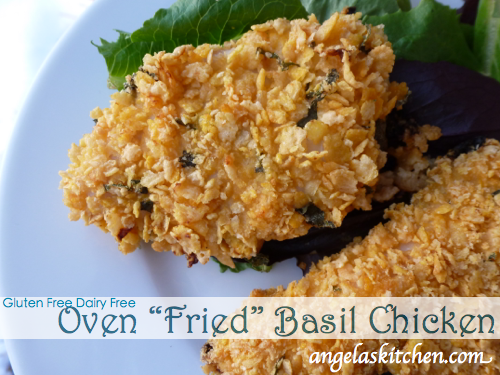 For the freezer: Make a double batch of Oven “Fried” Basil Chicken, one batch for dinner and one for the freezer. While eating dinner, allow second batch (cook second batch for 5 minutes less than the batch for dinner) to cool. After dinner when cool, place chicken into a freezer safe container separated by waxed paper, remove as much air as possible, then seal, label and freeze. My daughter is turning out to be quite a good cook. She wanted to make my pumpkin waffles, but found we didn’t have any pumpkin puree. However, we did have applesauce, so she use that instead and used cinnamon instead of pumpkin pie spice and before you know it we had apple waffles for lunch! Thanks, sweetie! We are going to make a BIG batch of these when it is time to stock the freezer with breakfasts for school. YUM! 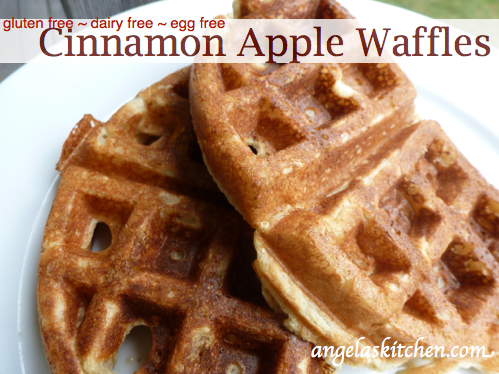 Printable freezer labels Cinnamon Apple Waffles. 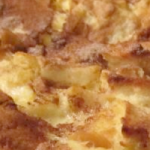 Printable recipe card for multiple batches of Cinnamon Apple Waffles. In a medium sized mixing bowl, mix the first five ingredients well. In a blender or separate bowl, blend the sweetener, oil, applesauce, dairy-free milk and vanilla until smooth. Pour the wet ingredients into the dry ingredients and stir just until combined. Cook on a waffle iron according to manufacturer’s directions. Alternate: Make pancakes instead instead of waffles in a lightly oiled pan. To serve: Heat through until warmed through. 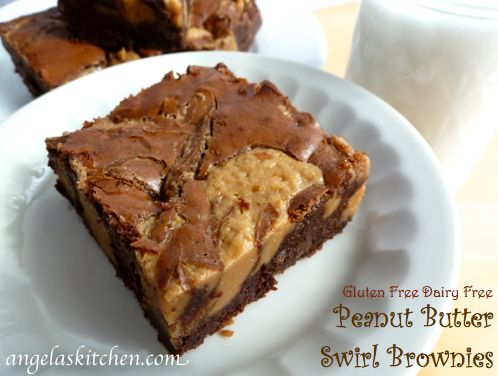 Gluten Free Dairy Free Peanut Butter Swirl Brownies were created because I have kids. I have kids who look at recipe magazines and cookbooks like they were novels (I wonder where they got that from…). Yep, and my youngest (the one we call the gluten free brownie monster) saw the peanut butter swirl brownies from Martha Stewart. 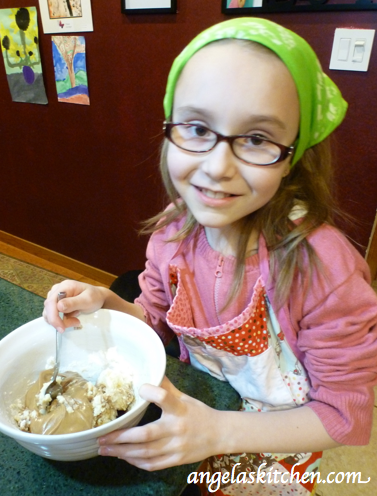 Of course, having a couple of her favorite flavors she wanted me to adapt them to be gluten and dairy free. Who can say “No” to this face? Not me! Sloppy Joes? That taste like pizza? Oh, yeah! 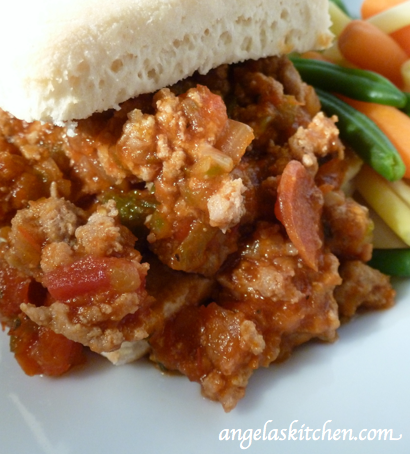 Gluten Free Dairy Free Pizza Sloppy Joes is one meal that gets everyone to the table. And, because you can prep and freeze it ahead of time, them cook it later in a slow cooker, it is one meal that is also easy on the family chef. Win-win! Printable recipe card for multiple batches of Pizza Sloppy Joes for freezer cooking (OAMC). Printable freezer label for Pizza Sloppy Joes. Brown ground turkey in skillet, breaking it up as it cooks. When it is all cooked through, add to slow cooker with all of the rest of the ingredients. Stir together until blended, put a cover on slow cooker, set to low and cook for 4 to 6 hours. To freeze: After browning turkey, allow to cool. After turkey cools, mix all the ingredients into a gallon sized freezer bag. Remove as much air as possible, seal, label and freeze. To serve: Thaw. Put contents in bag in to slow cooker, cover and cook on low for 4 to 6 hours. A few weeks ago we became the proud owners of 137.5 pounds of grass fed beef. This is what a quarter of a cow weighed. This is a lot of cow, but I couldn’t be more thrilled to have a nicely filled freezer full of tastiness. Mmmm… I have a nice homemade turkey sausage, but because I have such a nice amount of grass fed ground beef on hand I knew I needed to come up with a good beef breakfast sausage. And, because it is how I roll, I put instructions in so you can mix this up and freeze your sausage ahead of time if you choose. Printable freezer labels for Beef Breakfast Sausage. 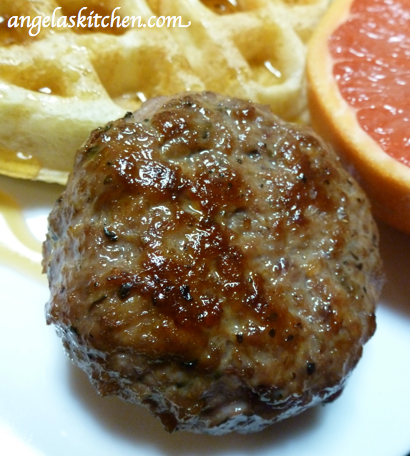 Printable recipe card for multiple batches of Beef Breakfast Sausage for the freezer. Mix all ingredients together in a bowl until well blended. Divide beef mixture into 16 patties. Cook in a lightly oiled pan until cooked through. To freeze: After mixing and shaping into patties freeze on a baking sheet lined with plastic wrap until firm. 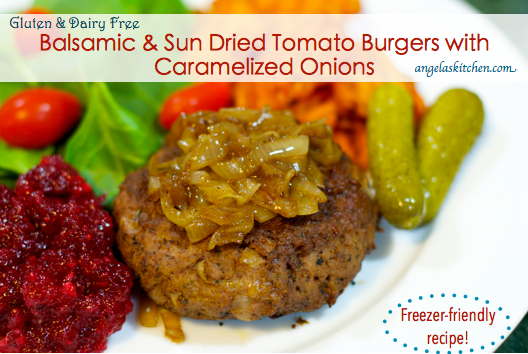 After the patties are frozen, place in a freezer bag separated with waxed paper. Remove as much air as possible, seal, label and freeze. To serve: Thaw or cook from frozen in a lightly oiled pan until cooked through.